First up, it’s a showcase of Australian poets from Word Travels! Miles Merrill, Melanie Mununggurr-Williams, and Emily Crocker join us offer a showcase of words from down under. Then it’s time for Mashed Poetics to celebrate its 10th anniversary and 42nd edition, with Come On Over by Shania Twain! A poetic lineup composed of festival artists, CIPS competitors, and local performers create new works responding to or riffing off of Shania Twain classics, with a live band covering the songs. Performing writer, Miles Merrill brought poetry slams to Australia from his home-town, Chicago. He is the driving force behind most spokenword programs and projects in Australia. Merrill tours internationally with artsts like Saul Williams and Shane Koyczan. He has hosted an ABC TV special on poetry slams, wrote/ directed a show in Sydney Fes)val, performed a solos show at Sydney Opera House and created spoken-word fesAvals – Night Words and Story-Fest. Merrill directs the literary arts organisation Word Travels and is founder of the internaAonal performing writers’ program: Australian Poetry Slam. He publishes text, video and audio but is best live. Melanie Mununggurr-Williams is a writer, poet and the 2018 Australian Poetry Slam Champion. A Djapu woman from Yirrkala in North East Arnhem Land, she is a proud wife, and mother of two young children. Melanie’s writng is oIen focused around family, place and her idenHty as an Aboriginal woman. As a mother to a child with autism, Melanie is a great advocate for raising autism awareness and uses her poetry as a means to do so. Melanie has spent the last decade working with families, young people and children involved with juvenile jusHce and department of children and families. Most recently she has worked as a mentor for young Indigenous women in various girls programs located in schools across the NT. Melanie writes in her free time. In April, 2018 Melanie had her story published in Anita Heiss’s Anthology “Growing Up Aboriginal in Australia”. She also she won the 2018 Darwin Poetry Cup. Emily Crocker grew up in Western Sydney and now flickers between Sydney and Wollongong writing and performing poetry. You might have seen her at Wollongong Writers Festival, Sydney Writers’ Festival, Unspoken Words Festival, Story-Fest or Noted Festival. Her debut chapbook ‘Girls and Buoyant’ was published last year by Subbed In. Other poems have appeared in places including Cordite Poetry Review, Verity La, Southerly, Seizure and Voiceworks. Emily’s recent projects include ‘OK, Now Spit’, a pop-punk spoken word show created in collaboration with guitarist Jay Bailey (Shopfront Arts Co-op, ArtsLab 2017/18), and ‘Sonnet’ (as part of All Ears, Campbelltown Arts Centre 2018). She is on the team that brings you Enough Said Poetry Slam in Wollongong, where she is known for writing audience-inspired poems on-the-spot. 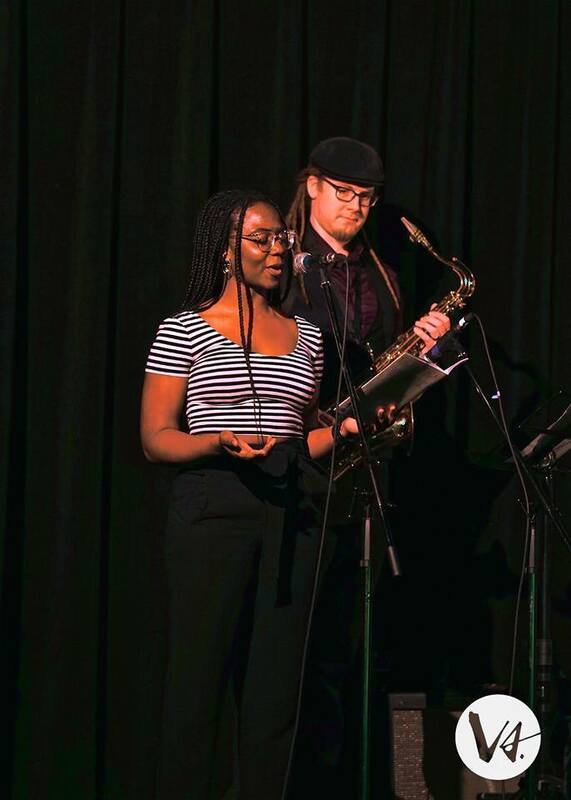 Mashed Poetics is a night of spoken word and musical mash up. It’s a quarterly event that usually calls Cafe Deux Soleils home. For each event they choose a music album and get a cover band to learn all the songs. Poets are then assigned a song from the selected album to create a new piece of work for the show. You’ll note on arrival a set of 10 railed stairs leading into the Hall. The wheelchair accessible entrance is around back. For this event, there will be someone posted at the back door throughout the event. Once inside, you’ll find a spacious wood-floored hall, open concept, tables and chairs set up throughout. The stage (accessible only via stairs) is to your left, and the washrooms towards the back of the hall. The washrooms are currently gendered but will be marked gender neutral for Verses. There are two sets of washrooms. The one to the right of the car, currently mark women is wheelchair accessible with no urinals and one additional stall. The one to the left of the bar, currently mark men, is on the same level and is now wheelchair accessible, with 2 urinals and one wheelchair accessible stall and one non-wheelchair access stall. The door has been adjusted to more easily fit wheelchair/scooter users. Overall the space is great. Please read the Radical Accessibility Mapping Projects Wise Hall overview for more details.